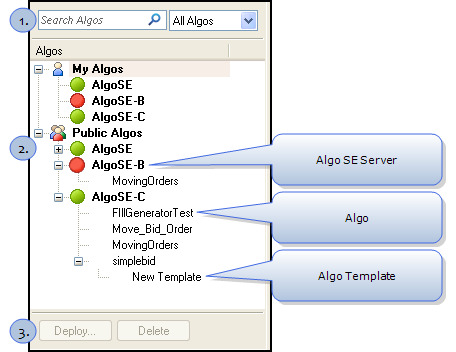 The Algo Explorer pane allows you to quickly locate and manage algos within a tree structure. The top level of the tree is split into two branches, My Algos and Public Algos. The My Algos branch contains all algos that have been deployed with your TT Username. The Public Algos branch contains algos that have been deployed and shared by other traders within your order book. The second level of the tree contains the Algo SE servers you have access to. The red or green circles to the left of the server name indicate the server status. Green indicates the server is active and red indicates the server is inactive. Algos that have been deployed to a server appear beneath the server name and are sorted alphabetically. Templates you created for an algo display beneath the algo name. Enter text to search the available algos in the Algo Explorer pane. Allows you to quickly filter the algos displayed in the Algo Explorer pane. All Algos: Displays all available algos. This is the default selection. My Favorites: Displays all algos that you have marked as a favorite. My Shared: Displays all algos you own and have marked as shared. Displays algos deployed and owned by you or anyone else who is mapped to the same MemberGroupTrader ID on the Algo SE; these algos are private unless you enable the algo’s Share parameter. Displays shared algos deployed by others with whom you share an order book on the Algo SE (i.e., mapped to the same Member and Group ID in TT Users Setup); the algo owner has enabled the algo’s Share parameter on these algos. Indicates that the algo has been marked as a favorite. Refer to Setting Favorite Algos in the Algo Explorer Pane. Displays the status of the Algo SE server. Green indicates the server is active and red indicates the server is inactive. Expand or collapse a tree branch. Right-click within the algo tree and choose Show/Hide columns from the context menu to display additional details about the algo. For a complete list of columns available in the Algo Dashboard window see Algo Dashboard Column Descriptions. Deletes the selected algos or algo template. Refer to Deleting Algos in the Algo Explorer Pane. Launches the Algos dialog box where you can deploy an algo to the selected server. Refer to Deploying Algos. Launches the Algos dialog box where you can update the selected algo. Refer to Updating Algos. Exports information about each algo to a CSV file.